We provide GreatCare® to seniors by awarding franchise ownership to passionate, hardworking, caring, persistent individuals that demonstrate good listening qualities, are coachable and have an entrepreneurial spirit. We help you succeed by teaching you our systems, coaching you to be great stewards of our brand and mentoring you to be a great business owner. If you want to change your life and get more out of your day than you put in, we are looking for you. The ability to connect with elderly clients on a level almost equal to a son or daughter is required. Our work will entail the tasks too menial for the common man, but too important for most who think it is beneath them. In truth, we provide life, sustenance, and many times a ray of sunshine and the light of hope. Seldom are we recognized for our efforts or our dedication, but our own knowledge – that without us forging an unbreakable wall of defense for the frail and elderly, they would be without the help they desperately need. 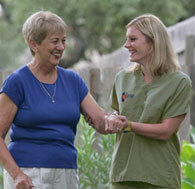 Since 1991 we have helped seniors stay healthy, happy and at home. We’ve been recognized as one of the fastest growing and successful companies in the U.S. by INC. Magazine, Entrepreneur Magazine and others. We’ve also received top marks in franchisee satisfaction by Franchise Business Review. Our experience and commitment to our mission of keeping seniors healthy, happy and at home provides the dedication and support you want to see in a franchise company. Caring Senior Service provides non-medical homecare services and safety care products to seniors who need assistance with daily living activities allowing them to remain in their own home. Our proprietary GreatCare® method provides superior services for our clients and a vastly rewarding business for our franchise owners through Quality Caregivers, Care Solutions, and Active Involvement. Multiple revenue streams – GreatCare®, integrated home safety solutions and supplies, and home modification programs. A turnkey business – We provide furniture, equipment & supplies and help setup your accounts so you’re ready for business. Unparalleled support – Quarterly training workshops, personal visits, and weekly phone support are just a few – so you achieve accelerated growth. Complete training – Not just a three-ring binder and some videos, but initial and ongoing hands-on training. Cost effective operating model – We’re fanatical about your bottom line.. Submit your information now – the seniors in your market deserve GreatCare® and you deserve to work with the best.